Articulate Storyline 2 makes it easy to create screencast videos and interactive software simulations. You simply capture the activity on your computer screen and then decide whether you want to use the finished recording as a video screencast or interactive simulation. Video screencasts are videos that show your recorded computer screen. They capture all of your mouse movements and any audio narration. The final output is a single video file. They’re great for “how-to” videos but aren’t very interactive. Interactive simulations simulate using the software. Instead of a video, you get single screens with linked hotspots and various help instructions. That means you can simulate much of the software’s interactions by having the learners click on the right areas or enter text just as they would with the real software. 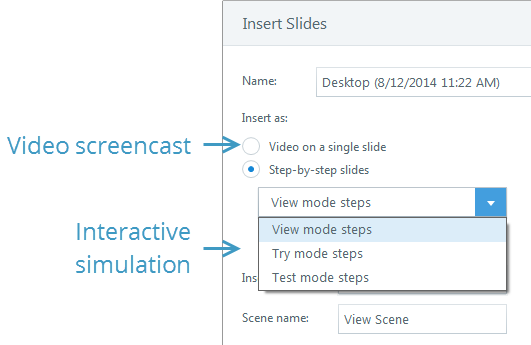 Articulate Storyline offers both types of screen recordings. You start by recording a video and from there you can choose to insert the video or an interactive simulation using one of the three modes. You can even change your mind at any time.